It’s a great time of year to see snakes. As the weather cools in the fall, snakes are especially drawn to places where they can soak up warm sunlight during the middle part of the day. That makes it fairly likely to see snakes (alive and dead) along roads. 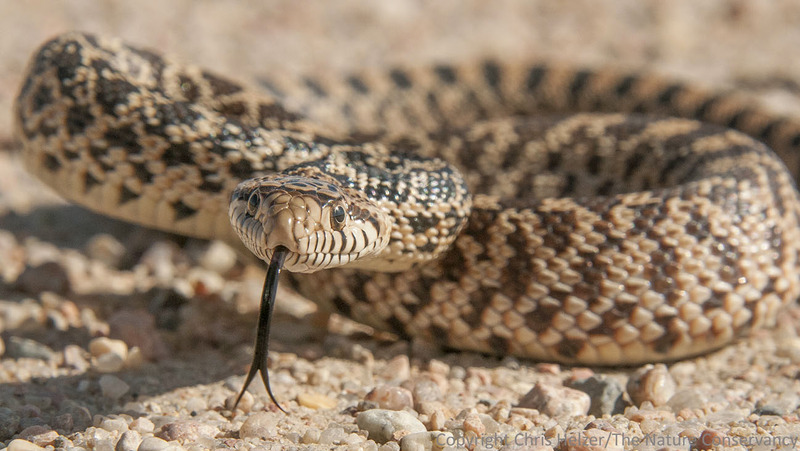 In addition, many snake species overwinter together in communal winter dens – particularly in higher latitudes. As they move from their summer feeding areas to those winter dens, they often have to cross roads and other open areas. This puts snakes at risk from cars and predators but provides even more opportunities for interested people to see snakes that can be difficult to find during the rest of the year. Yesterday, we spotted this beautiful young bull snake on a gravel road along the edge of one of our Platte River Prairies. It was only about 16 or so inches long, but it did a great job of making itself look menacing when we stopped to take a closer look. This little bull snake was doing its very best to scare me off, but it didn’t work. Instead it got its portrait taken. The Nature Conservancy’s Platte River Prairies, Nebraska. I felt badly that the snake was putting on such a great show to no avail. Maybe I should have acted a little more frightened. Instead, I photographed the poor snake for a few minutes and then left it alone – hopefully before I completely destroyed its self esteem. This entry was posted in Prairie Animals, Prairie Natural History, Prairie Photography and tagged bull snake, fall, grassland, gravel, migration, nebraska, platte river, prairie, reptile, road, snake by Chris Helzer. Bookmark the permalink. LOL nice job and love the pic. I had a baby bull the size of a pencil do the same thing to me this spring. You gotta give them credit for their fearlessness, that’s for sure! From the number of comments snakes must not be very popular. I guess people would prefer to be over run with mice. Love your posts, Chris. As a science teacher, I show your posts often to my classes.Thank you! Awesome! Great to hear. Thanks! Saw this photo ended up on the Nature Conservancy’s facebook page! Great shot! I always like seeing the coachwhips in the grasslands down here. A quick head poke above the grass and then off like lightning! Really nice post and great photo. So they could take pictures, that is.